Our first trip to Seoul was so much fun, I can’t stop raving about it! It was a three-day weekend trip, so I’ll break it up by days and by destinations. We took the early 9:40 a.m. bus from Gunsan Express Bus Terminal to Seoul Express Bus Terminal (aka Gangnam Bus Terminal). The trip took a little over 2.5 hours, and went by really quickly. When we arrived, the terminal was so big, it felt like a circular and unending maze. It took some effort, but we got out and found our bus. Google Maps was a godsend for this trip. It gave us the exact bus number and routes to take to any location. Immediately upon hitting the streets, we realized just how busy Seoul really is. People walked past each other in all directions. Buses and taxis flew by in a haze. Seoul has their transportation system down to the t! The streets are assigned by vehicle for efficiency. Buses have the left lane to themselves, which makes public transportation very desirable. The metro system is also supposed to be one of the most refined in the world, but the buses sufficed for us on this trip. We made it to our hotel area without any issue, and walked the extra block to get there. Since it wasn’t time to check in, we explored the surrounding area, and chose to eat at K-Texas: Western Ice Bar. If you’re a beer fan, this would probably be your Shangri-La. The food, however, was unremarkable. The fried chicken was decent, but the imitation chili left something to be desired. Down the street, I spotted an architectural feat I absolutely had to explore! It turned out to be the Choonghyun Presbyterian Church. It was closed, but we explored the grounds and captured some amazing photos. The Tria Hotel is very modern in architectural and interior design. Check-in was easy enough, and they may have updated us to a better room. They didn’t tell us, but we booked a royal deluxe, and ended up on the top floor in a suite. The room was spacious – in terms of Korea anyway. Everything was clean and they gave us full-size amenities. We’ve had our fair share of hotel experiences, and have never seen this. We were immediately impressed. As soon as our friends joined us, we made our way to the COEX Mall. Let me put the enormity of this place into context: I come from Dallas, TX. Texans love their malls, so I am no stranger to shopping areas with frenzied patrons. The COEX had so much going on at any time in any corner, it was dizzzying for me! Restaurants and shops alternated spaces in every hall. Multi-levels and maze-like halls had us in a navigational stupor. After an arduous journey through the space-time continuum that is the COEX mall, we finally made it to the aquarium! I had read reviews of the aquarium, and nothing I read did it any justice. I only have the aquariums in Galveston and Dallas to compare, but this one had so many fun displays! They had fish in varying tank themes, which made it extremely entertaining. There were the usual suspects, but also some fish I hadn’t seen before – such as the hideous Lookdown fish. I’ve seen stingrays, but there’s something about seeing a black thorntail swimming harmoniously with an albino stingray that made it so much cooler! The jellyfish displays were mesmerizing, and seeing the spider crabs made me both hungry and scared at the same time. What an experience! Right across the street from the COEX is the Bongeunsa Temple. It was established in 794, and have maintained its roots – even as buildings and commerce continue shooting up around it. 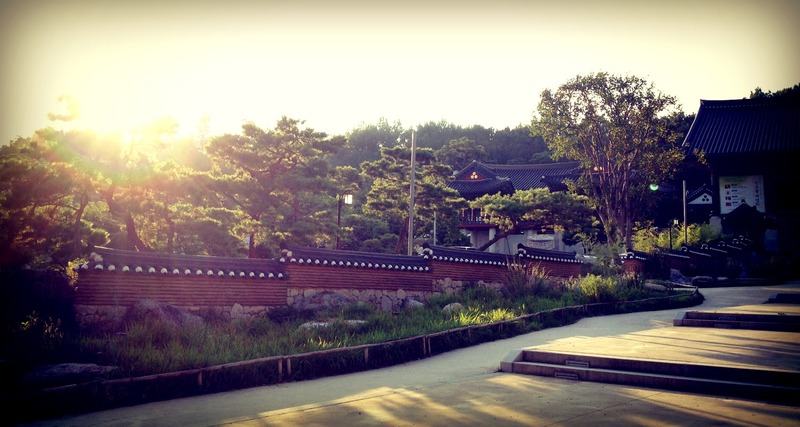 As soon as we walked into the temple grounds, an overwhelming sense of calm enraptured us. Things instantly felt simpler. Perhaps it was the serene service halls, or the prayer lanterns hanging above our heads, or the drumming of the monks nearby. If we weren’t running late for dinner, we could’ve easily spent hours there. Clint and I are no strangers to Brazilian steak houses. So when we found out there were a few in Seoul, we did our research and found one in Gangnam. Mercado is quaint in size, so it isn’t as intimidating as a Texas de Brazil. There was no salad bar, but they did serve salad and various side dishes right at the table. My favorite was the garlic rice. There were five different cuts of meat, chicken, sausages and chicken hearts. I consumed about five times the appropriate serving size of meat and rice. We ate until we dropped one by one like flies. I have to give it to our friend, Cisco, who put up the most noble of fights against the meat titans and came out honorably and victorious. Well done! We ended the night with a walk around the neighboring blocks, and inadvertently ended up right where we started. Across the street was a Tom N Toms Coffee. Dessert is always a must, so we got ourselves some drinks and honey butter bread (another popular dessert in Korea). The place was littered with couples talking and flirting. We sat down and recounted the day in elation. Just got to Seoul! It was a quick bus ride – easy breezy. — at Seoul Express Bus Terminal. Got some “Texas” food. — at K Texas. Fried chicken from K-Texas wasn’t bad. — at K Texas. The entrance to the hotel was rather tricky and obscure. — at Tria Hotel. The inside was quaint, but they seemed to be stuck in Christmas – snowmen and reindeer abound! — at Tria Hotel. Wall art inside the hotel. — at Tria Hotel. Royal deluxe suite on the top floor! — at Tria Hotel. Best thing about this hotel: they give you full-size products! — at Tria Hotel. First trip out to the COEX mall. — at COEX. Photo op! — at COEX. Clint said he didn’t want to be part of the cute, therefore the face. But you’re still cute anyway! 😛 — at COEX. Totoro display inside one of the shops. — at COEX. After walking through the craziest maze of a mall, we finally found the aquarium! — at Coex Aquarium. Every single person took pictures like this. It finally infected Clint. — at Coex Aquarium. Komodos! — at Coex Aquarium. The aquarium had some creative displays for their fish. Here, a lamp post tank. — at Coex Aquarium.